This Amish Blue Mountain Hickory rocking chair will make an outstanding addition to any living room, porch or patio. 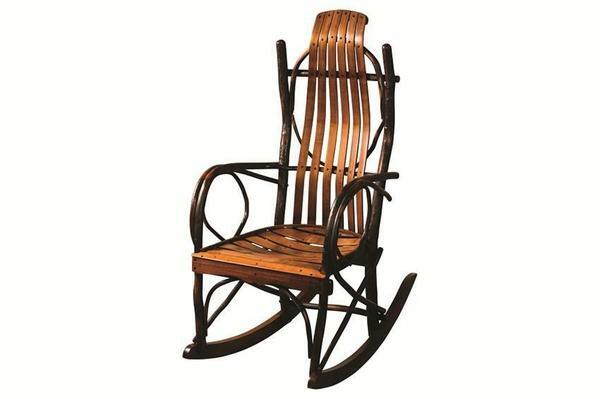 Because this American made rocker is built from solid rustic hickory wood by skilled Amish woodworkers, no two Amish Hickory Rockers are exactly the same, this Hickory Rocker will no doubt become an heirloom piece in your family for generations. The Blue Mountain Hickory Big and Tall Rocker usually ships in 5-7 Weeks. Never hesitate to call at 1-866-272-6773 for help if you have any doubts or questions. This porch rocker is handcrafted from hickory wood twigs and your choice of red oak, maple, cherry, walnut and hard hickory. It is big and tall for those who need a Rocking Chair that is taller than most. This Amish Big and Tall Rocker is 2" higher than our standard rocking chairs.